The AzuraQuant cDNA Synthesis Kit represents a core tool for the sensitive, unbiased synthesis of qPCR-ready cDNA, specifically for the use of 100ng Total RNA or less. Our thermostable HighTherm™ reverse transcriptase and companion 5x cDNA Synthesis Buffer provide very high cDNA yields and an excellent starting point for successful downstream qPCR assays. We are committed to providing the molecular biologist with high performance reagents, assay flexibility and cost-effective solutions. 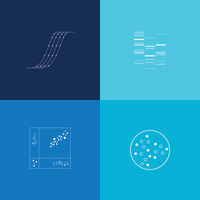 Coming Soon - Azura Genomics will release AzuraQuant High Capacity cDNA Synthesis kit for the generation of unbiased, fully representative cDNA from up to 5µg Total RNA, and the flexibility to prime with random hexamers, oligo (dT) primers or an optimized blend of both.